From left are: front, Max Isaac, Kim Isaac, Mya Jackson, Will Isaac and Jermaine Isaac; and, back, assistant coach Dustin James and head coach Zach Williams. 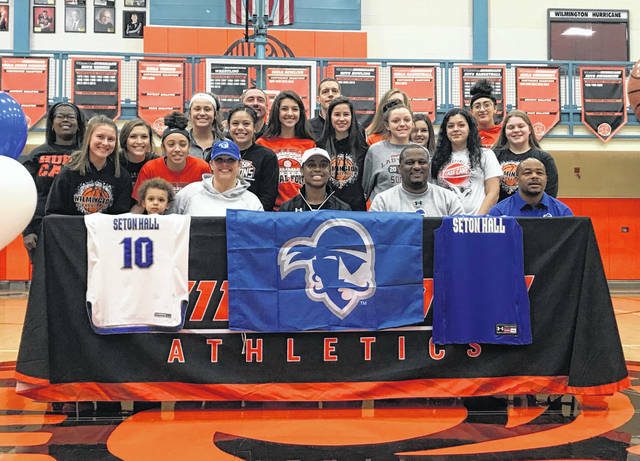 Family, friends, teammates and coaches join in as Mya Jackson signs to attend and play basketball at Seton Hall University. 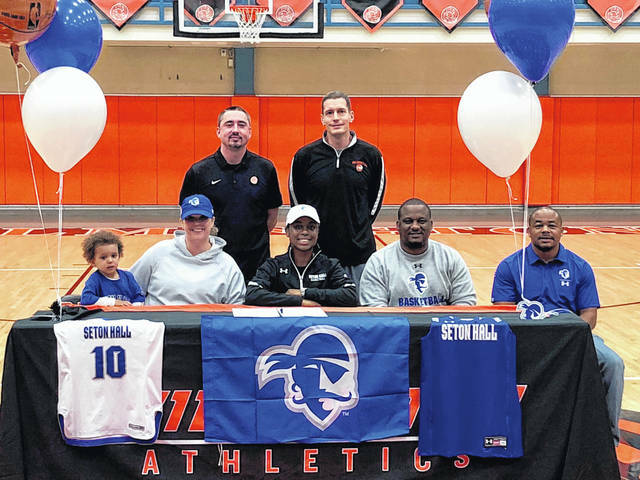 WILMINGTON — Wilmington High School senior girls basketball standout Mya Jackson signed her letter of intent Friday to attend and play for Seton Hall University in South Orange, New Jersey. The Pirates, coached by Anthony Bozzella, compete in the 10-team Big East Conference. Its members include Xavier, Villanova, Butler, Creighton, Providence, St. John’s and Georgetown, along with the teams that shared last year’s regular-season title, DePaul and Marquette. Seton Hall was 16-16 overall. “I am very proud and happy for Mya,” said Lady Hurricane coach Zach Williams. “She has worked extremely hard on her game both mentally and physically to get where she is now and where she wants to be. As a sophomore, Jackson earned honorable mention Division II All-Ohio basketball honors as selected by a media panel in the state. She averaged 20.6 points, 3.8 rebounds, 3.3 steals and 1.5 assists per game for the Lady Hurricane. She was the top underclassmen on the District 15 coaches all-star team and is a top 50 player in the Dabbelt Report. As a junior, Jackson was named Division I second team All-Ohio by the Ohio Prep Sports Writers Association. Jackson led the team to a 20-3 record and was also named to the first team Division I All-Southwest District girls basketball team. She averaged 23 points, four rebounds, four steals and three assists per game for the Lady Hurricane. She was the SBAAC American Division girls basketball player of the year. The Hurricane girls basketball team tips off the season at 10 a.m. Sunday, Nov. 25 at the Journey to the Tourney at Lakota West High School versus Loveland. Jackson needs just eight points to become the most prolific scorer in Clinton County girls hoops history, passing East Clinton’s Robbin Luck. — The News Journal’s Shawn Robinson contributed to this story.